I was lucky enough to get a late ticket to WMAW 2017 and spent an amazing few days in Racine, Wisconsin, learning from HEMA practitioners from all over the world. 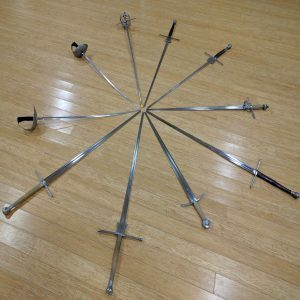 On the last day of the event, I asked eight experienced longsword fencers to explain how they perform a parry by thrust, or absetzen. In the sixth and final video in this series, Devon Boorman of Academie Duello and Duello.tv explains his take on the technique. I am sincerely sorry, especially to Devon, that it took me so long to make this post. Partly I put it off because my dang head is in the video this time, not just my voice (which was bad enough) and I hate being in videos and photos. But mostly it’s because I’m the officially-recognized worst procrastinator in the galaxy. There is a gelatinous life form on an outer spiral of Andromeda who has been moving “do taxes” to tomorrow’s todo list for 8 million years & took the intergalactic title, but it’s a close competition. One absetzen to break them all? Me: Devon, does your system have the concept of a single-time parry by thrust, like an absetzen? Devon grins and reveals that he does, in fact, know what an absetzen is. In fact he has traveled around the world and specifically invited various fencers to do their absetzens at him and try to make one work. Many have tried. Many have failed. Devon’s absetzen is based on manipulating the point of his sword to gain a dominant angle over the opponent’s sword and thus control the line of attack. The question of which edge to use depends on the situation, but again, it’s all about leading with the point. “A lot of people will roll to their false edge in a way that looks like this.” Devon demonstrates a suboptimal angle that gives me an opportunity to gain the crossing. Again, the point is key. Guide the force of the blow down the slope of your sword and into your crossguard (and hence, the ground) by leading with the point. This is the fifth in a series of blog posts in which I’ll attempt to find underlying principles to be drawn from varying interpretations of this technique. In this three-in-one episode, Ted Elsner (Lead Instructor at Sacramento Freifechter), James Reilly (Lead Instructor at WHFA: Kenosha-Racine), and Robert Rutherfoord of Chicago Swordplay Guild demonstrate another interpretation of Absetzen. Ted emphasizes the need to aim the point slightly over the opponent’s shoulder for the counterthrust, rather than aiming at their face. The opponent’s blow may helpfully direct your point into their own face; if not, you still gain control over their sword through mechanical advantage. Ted outlines three possibilities for footwork, from safer to more daring. More conservative options break the absetzen down into a multiple-tempo technique, more like a parry-riposte. The riskiest option carries the highest payoff (and looks the coolest). All three options use the same overbind mechanics. In the previous episodes, our instructors emphasized the importance of keeping a sound structure to make sure the Absetzen can stand up to a heavy blow. Robert shows us how extended arms also divert the opponent’s point. “The more I extend my arms, the more I keep his point away from me,” Robert says. This is the fourth in a series of blog posts in which I’ll attempt to find underlying principles to be drawn from varying interpretations of this technique. Jake Norwood is a HEMA-famous fencer, competitor, teacher, and community organizer. He runs Longpoint and sometimes blogs for the Liechtenauer Federation over at xKDF.org. In this episode of Absetzen at WMAW, common themes continue to develop. Jake, too, emphasizes hip drive, body structure and timing as critical components of a successful absetzen. As Jake raises his hands, Tea shows the error of his ways with a slice under his forearms. “Actually the trick is not to go high at all… you want to stay approximately at eye level to your opponent,” Jake says. Jake creates a strong structure by keeping his arms braced in front of his sternum. If he needs to change the angle of his arms, he rotates his torso to preserve that relationship. He shows how withstanding a hard cut uses the same physical principles as supporting your body weight while doing pushups – both will be very difficult for most people to do if your arms aren’t aligned in front of your sternum. This is the third in a series of blog posts in which I’ll attempt to find underlying principles to be drawn from varying interpretations of this technique. Jan Deneke is a longtime student of the Liechtenauer tradition.Check out Jan’s videos on his YouTube channel. He is currently training at the Tosetti Institute of MMA. Jan begins his absetzen in right pflug, with his hands crossed near his hip. As Stacy’s attack develops, he uncrosses his hands and delivers a single-time counterthrust, intercepting Stacy’s blade with his short edge. For stability and strength in the bind, Jan switches to a thumb grip as he rotates his sword to use his short edge. Absetzen can be deployed against a variety of cuts and thrusts, both high and low. Against a low thrust, Jan’s employs the same mechanics – winding from crossed hands to uncrossed, and intercepting with the short edge. Like Tea and Jessica, Jan emphasizes that Absetzen relies on timing. Jan starts his absetzen “…when [his opponent] is committed to a thrust or a cut, so that I can nail her inside her tempo.” As we saw in Jessica’s video, if you attempt to deploy absetzen before your opponent’s attack is sufficiently developed, it’s very likely that they will change plans and absetzen will fail. This is the second in a series of blog posts in which I’ll attempt to find underlying principles to be drawn from varying interpretations of this technique. Jess Finley is a wrestler, fencer, and HEMA instructor. She is the author of Medieval Wrestling: Modern Practice of a 15th-Century Art. Check out Jess’s blog, Ritterkunst, for her research and training ideas. Here, Jess demonstrates the basics of her absetzen against attacks from Jake. Jess’s absetzen relies on a clear setup with an invitation to strike at her head. In response to Jake’s overhead cut, Jess drives her sword across the line of attack, using her hips to pivot. Demonstrating the technique against a much larger opponent, Jess creates a strong body structure with straight arms and high hands to stay safe. Jess shows how she would tempt an opponent to strike at her head, creating a dynamic invitation by moving in and out of distance. Before committing her feet to a step, Jess drives forward with her sword to close the line, powering her body with her hips. At 2:10, note how Jess turns out her lead foot before she moves her rear foot. This opens her hip position and helps her to use body rotation to close the line and create a strong angle against Jake’s sword. This forward presssure keeps Jess safe. She doesn’t obsess over details she can’t control – such as where on her opponent’s sword she intercepts their blade. This is the first in a series of blog posts in which I’ll attempt to find underlying principles to be drawn from varying interpretations of this technique. Some discussion came out of the first two videos in this series about whether to use the long or short edge to engage the opponent’s blade when forming the parry. Tea Kew is an instructor with Cambridge HEMA, a historical fencing club in Cambridge, UK, with a focus on Ringeck’s longsword. When you stand against him in the guard of the plow from the left side: if he then hews to the upper opening of your left side, then drive up with the sword, and wind to the left side against his hew (such that the hilt is in front of your head), and step into him with your right foot and stab him in the face. Tea demonstrates his interpretation of Ringeck’s absetzen against a thrust and a cut. The key components of Tea’s interpretation of this technique are a clear invitation; correctly closing the opponent’s line of attack; engaging the opponent’s blade with the long edge; and creating a strong body structure to resist a heavy blow. Tea makes a wide invitation to draw a predictable attack from Shanee. To draw a thrust, he starts with his hands low near his right hip, point high and well offline to the upper-right. As Shanee thrusts to Tea’s deliberately widened inside line, Tea takes a step out to his right and crosses his sword over hers to control it with his long edge. Tea’s absetzen is a single-time thrust parry. However, to emphasize the importance of correctly closing the line of his opponent’s attack, he suggests thinking about the technique as two actions. Tea makes an alternate invitation, this time to draw a cut. His hands are low at his left hip, and his point drifts to Shanee’s left. Shanee demonstrates a high overhead cut to Tea’s upper-left quadrant. In response, Tea pivots, turning his core toward the attack. He punches his hilt high, arms straight, and delivers his counterthrust. Tea uses the angle of his sword, and proper alignment of his blade, to protect his hands. In historical fencing, we have developed a culture of valorizing injury and hard striking. We post photos of bruises or destroyed protective gear, inviting others to admire the risks we take in fencing; our toughness as we fight on through danger, injury, fatigue, and pain. Some instructors brag about their students’ reputation for hard hitting in tournaments. To avoid singling out individuals or schools, I won’t give any examples except my own. I’ve posted pictures of my bruises online. I’ve shown off my dented fencing mask. I’ve told the story of that time a fencer disarmed me and I punched him so hard in the face that his fencing mask scraped the skin off the bridge of his nose. Toughness, both mental and physical, resilience, daring, fortitude, and courage are fine qualities, and as martial artists we want to build them all. But does valorizing our injuries and our heavy strikes really promote these qualities? I argue that it doesn’t. Rather, it promotes carelessness, disrespect for our own and others’ bodies, needless risk-taking, and plain stupidity. Heavy bruising isn’t a good thing; it’s evidence that both fencers screwed up. The bruised fencer got hit. The fencer who hit them did so with insufficient control, or without respect for their body, or both. I want to fence for the rest of my life. I can’t do that if I destroy my body, or if I’m a drooling mess from accumulated brain injury. Even in the short term, I can’t train as effectively with bone bruises on my forearms and deep contusions in my thigh muscles – no matter how “tough” I am. This goes for my training partners, too. I realise that this does lead to limitations on what I can achieve with my sparring, and I often lose training fights with people who expect me to win against them. It means that in tournaments and competitions, I don’t always place as well as I know I could, if I were to compromise on the standards I set for myself. This attitude is equally applicable to control and self-moderation in striking. I want to fence until I’m 128, and I want my training partners to do so too. I would rather not land any strike than land one that I can’t control. I would rather not hit my opponent than hit them and injure them. When I train, my goal is to fence with total control over my sword and my body: to strike where and when I want to, with the exact amount of force that I choose. I want to be able to face off against a heavy hitter and maintain my composure, using only enough impact to make a valid touch, even when my opponent is coming at me like a truck. I’ll give respect, even when I don’t receive it. Maybe I’m not at that point yet, but I’ll get there. That’s what becoming a martial artist means to me.